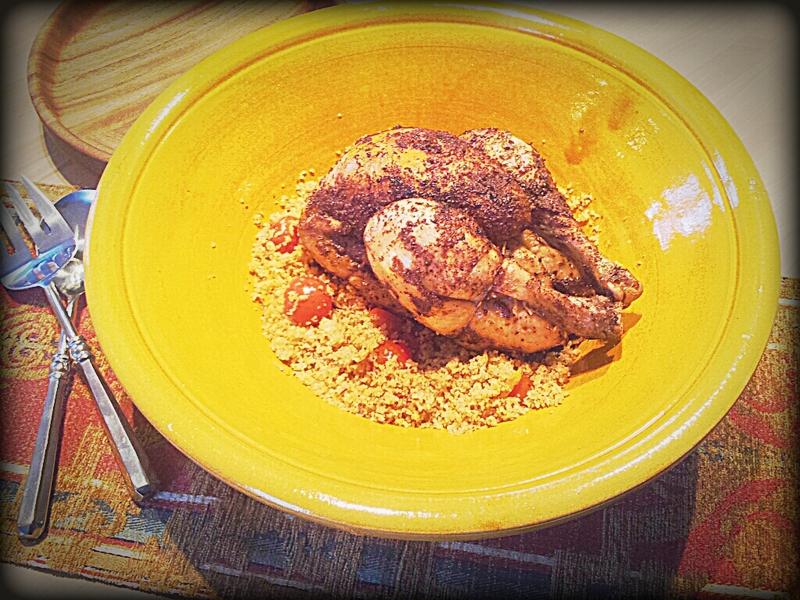 A Normandy Kitchen: Sumac Roasted Chicken and Couscous. I have the perfect Moroccan dishes to serve this sumac chicken and couscous!!! Yum! Ivan, what dessert would you serve with this? The dishes make the dinner! I bet you bought some wonderful ones back from Marrakech (I only bought one back and it got broken sadly). I actually made (and often make) Baklava, I didn't do a post, as I has some amazing orange flower blossom jam added in (not a normal addition!) and that's hard to get. It's wonderful being small but sweet and help yourself! I love chicken, but when my mommy makes it- it does not look good- like yours does. Mommy burns everything. 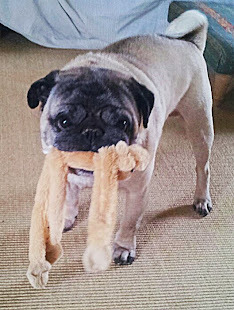 Aww, tell mommy slow and low, as I know all pugs love, love, love chicken - Aston sings when the chicken comes out to be carved! Thanks for the recipe, Ivan! When I get my legs back I can look at trying out what look like wonderful cooking options! Thanks, thats really kind of you. Hope you are doing good and writing/playing plenty of music - it will mend you quicker! I love the flavour of sumac, your dish sounds lovely. Thanks, isn't it pretty special, love the colour of it also! I must time my reading of your posts Ivan when I am NOT hungry!!! lol This looks delicious and I am very interested in finding out the flavour of sumac. We have a sumac shrub/tree out front, I wonder if this is one and the same plant? I will investigate. I will have to post a rumbly-tummy-scale-warning!! Thanks, I actually for many years bought it in Montreal, so I am sure there must be a mail order place (get Ron on to it!). Yes, there are many varieties of sumac trees, some are very poisonous so I would not take the risk without a specialists view. The things I learn from you, Ivan! I didn't know there was an edible sumac. I once lived in rural Maryland, where Poison Sumac was plentiful. I don't know if really was poisonous, but it would give you a heck of a rash, like poison ivy. Thanks, Yes, many varieties of sumac and some as you say are really not for eating (poison ivy, same family I think)! Best to source it online from a foodie place. It seems to be sweeping the uk after Yotam Ottolenghi used it; Waitrose would be the best place or online. I have been using it for years and and so happy people can get hold of it now! Bonjour Ivan! Just found you as a new follower on my blog! Merci beaucoup! This looks amazing! Do you mind telling me which shop/market that sells sumac? I am in Normandie as well--and would love to try to make this! Can't wait to explore your blog and other recipes! Bonne journée à vous! 'Nantucket Daffodil' told me about your blog and I love watching renovation projects (especially in Normandy and other peoples ours is ever on going!). I got my sumac from (Monsieur E!) Leclerc in Bernay also in Evreux but you could get it online easily also. It is fabulous with vegetables also (for you!!) - I am thinking you are roughly Cormeille way (trouville at the minute?) but the little Carrefour in Deauville near the horse track stocks a bit of 'foreign' food, but not sure. I look forwards to reading your posts! Hi Ivan, I love couscous, thaks for sharing it. Thank you, very pleased you like this the preserved lemons are a real must for me! Hi Ivan! Another gorgeous dish! I didn't know you could eat sumac; I thought it was poisonous! Besides trying to eat more vegetables, I've been trying to expand the kinds of grains I use. I haven't been too psyched about couscous, but I'm going to try your recipe and see how I like it. I've just cooked my first farro in the past two weeks! What a yummy grain. You have me upping my culinary game ~ thank you! Head scratches to Aston! Happy to see you, thanks - there is a lot of poisonous sumac as you say, so best to buy it online than to pick it! Couscous is really an easy grain to cook and good hot or cold. The leaving it alone and then to cool a bit is key. They can stick together but use a fork to separate them, same motion as beating an egg but slower (also slightly less water is better than too much water!) 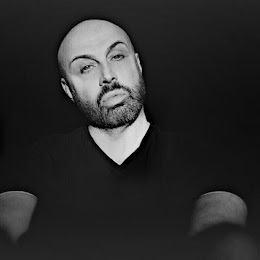 Enjoy and I am happy you are trying so many new things!! Oh what a lovely meal Ivan. There is something so wonderful about the smell of a roasting chicken. It is a comforting smell. Brings back childhood memories of Sunday dinners. Thank you, I also have that wonderful childhood nostalgia smell of a chicken roasting on a Sunday! It make a house a home! Have a wonderful weekend and hope you have nice gardening weather! 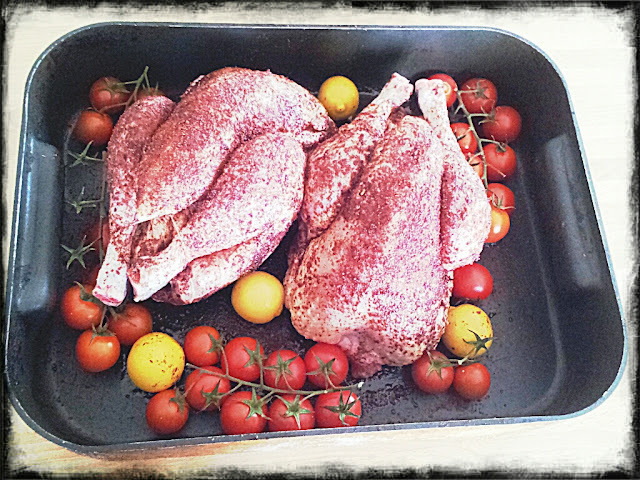 I do love roast chicken but sumac berries are something I have never considered before. And they are found in M. Leclerc's 'little' shop? Well now I know what else to add to my next French holiday shopping list! Mind you I have just checked and see they are available here too - a little expedition might well be mounted this weekend as I do like a lemony taste to food. Thanks for this post - I enjoyed it! Everyone seems to go to Morocco but we have never set foot there - I shall have to talk to AGA about this! Have a good weekend, I imagine you have some nice weather as we do, especially tomorrow! Hello Ivan! I do not know sumac, but I imagine an exotic and delicious taste. Have a nice day!! It's well worth finding if you get the chance, I hope you have a good weekend! Absolutely beautiful ! Thanks for sharing your meal with us. Thank you for stopping by and your kind comment. You have a really wonderful blog that I will definitely be going back to! Have a good weekend. Hi Ivan! Thanks for commenting on my last posting! This recipe is really easy to make and looks fantastic to eat too! I imagine the difference is all in the sumac. I'll try it, if I can get me some! Thanks for sharing! Thanks for dropping by, yes the sumac is the star but the dish is nice if you can't find any (but adding lemon zest, red pepper/paprika (sweet one) and some lemon juice once the chicken is cut up could be similar) . I am trying to do your food challenge, just so much going on at the moment! Like Terry, I have only ever heard of Poison Sumac! Your dish looks like it would be wonderful. Thanks, I also like trying new foods, internet is good to order it or I will have to make it when you visit France!! Bonjour, Ivan -- No luck so far with finding sumac here in the US. I'm wondering what if any other spice(s) could give about the same results. Possible, or non? Sorry, it's been hard to find (I was hoping it would be more available Stateside). That said I think you could get near it a bit with sweet paprika (or even I once had bell pepper powder - really nice) mixed with zest of lemon, salt and pepper and a tiny bit of fine sugar to balance (use as a rub - lemon or two in the cavity also) and a squeeze of the cooked lemon juice over the carved chicken. Hope this helps, it won't be as earthy but still nice. also what you may see is ZAATAR which is another good mix with thyme, sesame seeds and sumac (not the same but can be used the same way). Oh wow this seriously makes ms hungry!!! Pleased you like it! Thanks for stopping by! This recipe looks great! I'll try it. Thanks, hope you enjoy making this one! Hope you are having a good weekend. Now I know what to do with the jar of Sumac sitting on our shelf! The Mr was given it along with some Dukka (which we use a lot) in a Christmas hamper and we haven't touched it yet! Happy to help!! I use Dukka a lot also, adds a great taste to many things, I have to make my own as we can't get it easily here. Hope you enjoy the Sumac!